WHO Director-General Margaret Chan (left) and head of the Secretariat of the Framework Convention on Tobacco Control (FCTC) Haik Nikogosian. Twelve countries today signed a new United Nations treaty that aims to counter the illegal tobacco trade, which undermines regulation policies and represents a burden for health care systems. 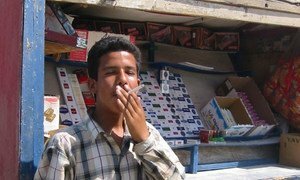 Representatives from China, France, Gabon, Libya, Myanmar, Nicaragua, Panama, the Republic of Korea, South Africa, Syria, Turkey and Uruguay signed the UN Protocol to Eliminate Illicit Trade in Tobacco Products during a ceremony at the UN World Health Organization’s (WHO) headquarters in Geneva. “The protocol gives the world a unique legal instrument for countering and eventually eliminating a sophisticated international criminal activity that costs a lot, especially for health,” said WHO’s Director-General, Margaret Chan, during the signing ceremony. The new Protocol aims to help protect people across the globe from the health risks of tobacco, which kills nearly six million people every year. Approximately one person dies every six seconds due to tobacco and this accounts for one in 10 adult deaths. The treaty advocates combating the illegal trade in tobacco products through control of the supply chain and international cooperation. As a key measure, Parties commit to establishing a global tracking and tracing system to reduce and eventually eradicate illicit trade. The Protocol to Eliminate Illicit Trade in Tobacco Products was adopted at the fifth session of the Conference of the Parties to the WHO FCTC, on November 2012, in Seoul, in the Republic of Korea. WHO noted that the Protocol will remain open for signature at UN Headquarters in New York until 9 January 2014 and will enter into force 90 days after the 40th Party has ratified it. Highlighting the impact that the adoption of a new anti-tobacco treaty may have, the United Nations top health official today spoke out on gains and challenges in global efforts to reduce tobacco consumption and exposure to smoke throughout the world – and encouraged further action in these areas.